Prime Minister Sheikh Hasina on Saturday said the Rooppur Nuclear Power Plant is being constructed with taking full security measures, adding the design of the plant has been developed in such a way that it will not succumb to any accident – natural or man-made. Highest measures are being undertaken to avoid any sort of risk for the people, she said, adding that Russian Federation will take back spent nuclear fuel of the plant and a deal has been signed in this regard. The prime minister said this while addressing a gathering on the occasion of the First Concrete Pouring Ceremony of the Second Unit of Rooppur Nuclear Power Plant in Rooppur today. Prime Minister Sheikh Hasina hoped that the Rooppur Nuclear Power Plant would play an important role in the journey to turn Bangladesh into a middle income country. She said electricity is a key element for socio-economic development and adequate and reliable supply of electricity is an important prerequisite for attracting both domestic and foreign investment. The government has taken steps to reach electricity to all citizens and various productive sectors as electricity is in the priority list of the demand of the people. Deputy Prime Minister of Russian Federation Yury Ivanovich Borisov attended the function as the special guest with Minister for Science and Technology Yafes Osman in the chair. First Director General of Rosatam Laxin Alexander, Director of International Atomic Energy Agency Dohee Hohn spoke, among others, on the occasion while Secretary of Ministry of Science and Technology Md. Anwar Hossain gave welcome address with an overview of the power plant. Cabinet members, PM’s advisors, officials of Bangladesh Atomic Energy Commission and Bangladesh Atomic Energy Regulatory Authority, senior atomic energy officials of India, Chiefs of three services and senior civil and military officials were present. 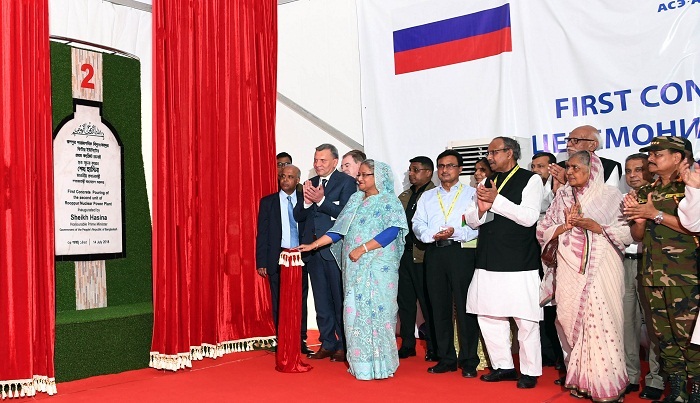 Sheikh Hasina conveyed her gratitude to the Russian government and its people for extending their support to the project. With the first concrete pouring of the second unit, Sheikh Hasina hoped that construction of the Rooppur Nuclear Power Plant will be completed within the stipulated time and Bangladesh would become 33rd country of atomic energy club. First Concrete of the First Unit of Rooppur Nuclear Power Plant was poured on November 30, 2017 and in last seven months, the work of the first unit made a good progress. Sheikh Hasina said in order to have a sustainable power supply, her government, in the energy policy, has laid importance on alternative sources of energy like solar power, nuclear power, wind energy, etc. alongside fossil fuels. As part of a master plan of the electricity producing, the government has taken decision for commissioning the Rooppur Nuclear Power plant with total capacity of producing 2,400 megawatts of electricity by 2023-2024. Terming the construction of Rooppur Nuclear Power Plant a long-cherished dream of the nation, the prime minister said, the seed of the dream was sowed in 1961 when some physical works, including land acquisition, were completed. But the Pakistan government abruptly stopped the work and shifted the plant to West Pakistan showing step-motherly attitude to the East, she said. The premier said the Rooppur Nuclear Power Plant was a dream project of Bangabandhu. After independence, he took an initiative to construct nuclear plant and started work. But the entire project was abandoned after his brutal assassination in 1975. Sheikh Hasina said no government for long 21 years had taken any initiative for the project. The Awami League government, after coming to power in 1996, worked out a time-bound plan with International Atomic Energy Commission-IAEA. But before completion of the entire process, the tenure of that government was expired. After coming to power in 2001, the BNP-Jamaat government stopped implementation of many people-oriented programs, including the Rooppur power plant project, she said. Sheikh Hasina said after assuming office in 2009, her government had revived the project and came to an agreement with Russian Federation for implementation of the project. “As a trusted friend, Russia not only extended material and moral support to our liberation war in 1971, but also took part in rebuilding war-ravaged Bangladesh after its independence,” the prime minister recalled. Now country’s total capacity of electricity production rose to 18,353 MW and 90 percent people is under electricity coverage. Over 4.5 million solar home systems have been set up in the areas where transmission line is difficult to be reached, she said. About the concern of a section of the people over safety of the nuclear power plant, the prime minister said safety of nuclear power plant is indeed crucial and we are very much aware of it. “We are strictly following the IAEA safety standards and other relevant guidelines as well as international good practices in building the Rooppur power plant,” she said, adding that the Rooppur plant is being constructed with G3+ Russian reactor which contains the latest technologies for safety measures and radiation control system. Sheikh Hasina said the government has enacted the Bangladesh Atomic Energy Regulatory Act- 2012 to strengthen national nuclear regulatory infrastructure to ensure safe and secure applications of nuclear techniques. An independent nuclear regulatory authority – Bangladesh Atomic Energy Regulatory Authority (BAERA) has been formed and bilateral relationship with nuclear regulatory bodies of the Russian Federation and India as well as IAEA has been established for the capacity building of the regulatory authority. The President of Russian Federation has assured me of the safety issue. The construction firm Atomstroyexport has been constructing the plant maintaining international standards and ensuring all safety issues, she said. The prime minister said the government has taken initiative for creating necessary manpower for safe operation of the Rooppur Nuclear Power Plant. Recruitment of personnel and staff and their training in India and the Russian Federation have already been started, she said. “Not only for Rooppur Power Plant, we are also preparing skilled manpower for maintenance of our Satellite Bangabandhu-1, “Sheikh Hasina said. “We have no dearth of talented youths. If proper training is given, our youths would be able to operate these high-tech machineries,” the premier added.